Okay, you all. I just gotta write about another Bruce Eric Kaplan picture book, because whenever he writes and illustrates a new one, I’m reminded how wonderfully weird and refreshing they are. I see a lot of picture books on a regular basis, you see, and some of them start to blur together in my vision, but when one of his shows up, I know I’m likely in for a laugh. Let me back up first. 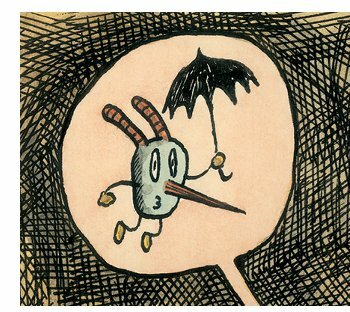 Kaplan is a cartoonist, whose work regularly appears in the The New Yorker, and since he’s known for his darker humor, his picture books have a touch of that as well (which means, of course, I’m going to be drawn to them). Dark humor in picture books is an easy thing to get wrong, though, yet Kaplan hasn’t made a misstep yet. At least, not in my book anyway. 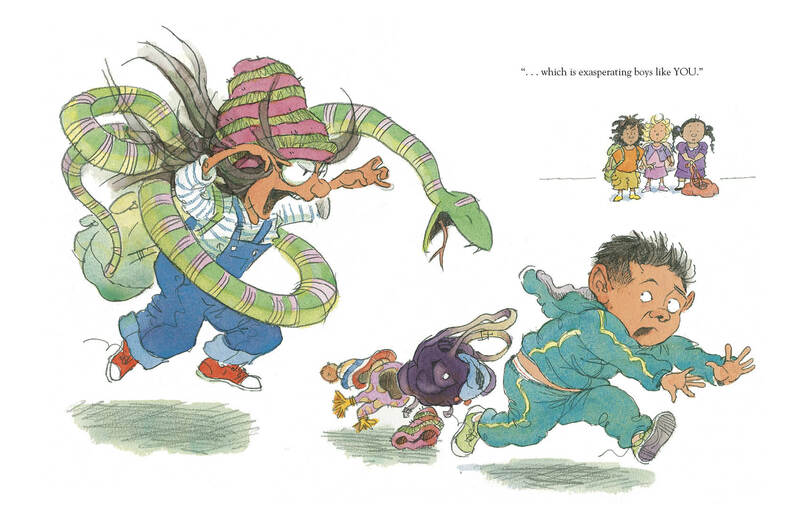 His debut picture book was 2010’s Monsters Eat Whiny Children, featured here at 7-Imp, and this was followed last year by Cousin Irv from Mars, which I wrote about here at Kirkus (and followed up here with art). That’s right. Despite photographic evidence from last week, Peter Brown is not actually a monster. 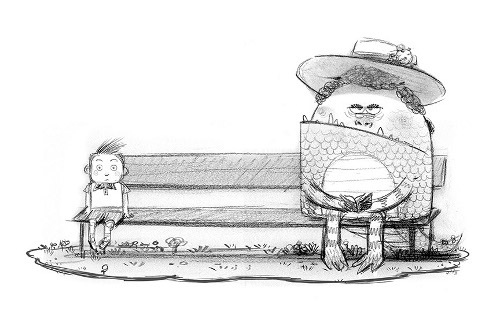 Since I chatted (here) last week with Peter about his newest book, My Teacher Is a Monster! (No, I am Not. ), published by Little, Brown, I’m following up today with some images he sent — some final art from the book but also early sketches, an outtake, etc. The early sketch above cracks. me. up. Debut author-illustrator Mike Curato is visiting for breakfast this morning to share lots of art and talk about his new book, Little Elliot, Big City (which I think actually comes out today — I swear I don’t plan these things, but I just get lucky with my timing sometimes). 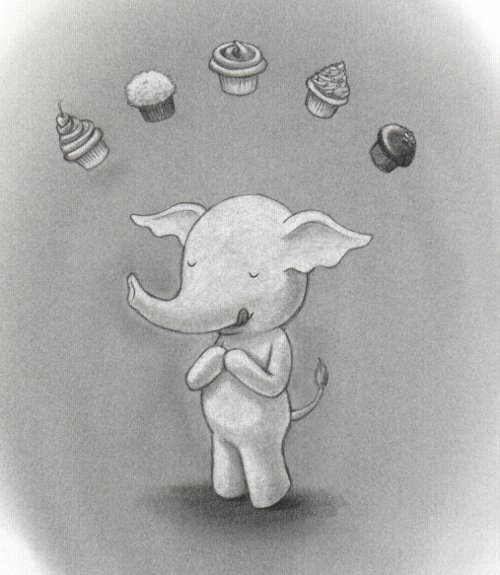 Clearly, based on the sketch of Elliot above, we must have cupcakes for breakfast. Actually, Mike agrees, when I ask him what he’d like on his plate. “If I could choose whatever I wanted without consequence,” he told me, “I’m sure I’d start off my morning with a cupcake. (Aren’t muffins just really boring cupcakes anyway? )” He went on to say that he usually starts his day with something a bit healthier, but I’m all for this cupcake plan (healthy schmealthy), so let’s just DO IT. Little Elliot tells the story of a tiny (cupcake-loving) elephant, who heads intrepidly into the big city and eventually makes a new friend. Booklist praises Mike’s “almost cinematic artwork,” and the Kirkus review notes “the meticulous beauty” of the illustrations. Mike’s here today to show us some of that, as well as some other illustrations. I’ll get the cupcakes and coffee out, and I thank him for visiting. “When Julia was very little, she had a splendid meal of sole meunière. And that was that. Julia fell in love with French food. She loved to eat French food. 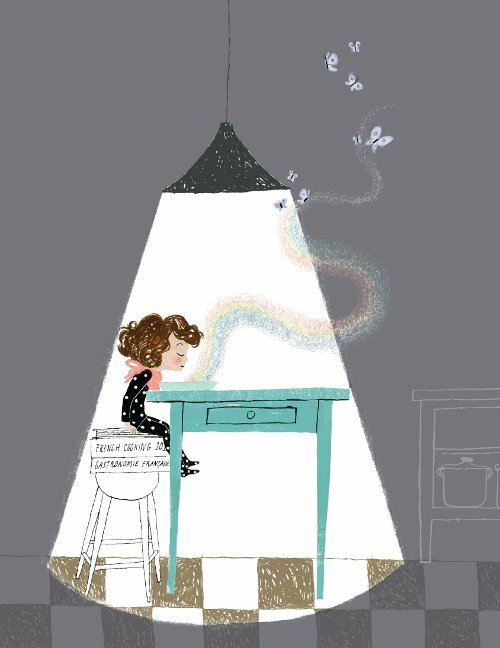 I think this is the first time I’ve featured the illustrations of Julie Morstad here at 7-Imp (oh wait, I have some of her art here from back in 2012). 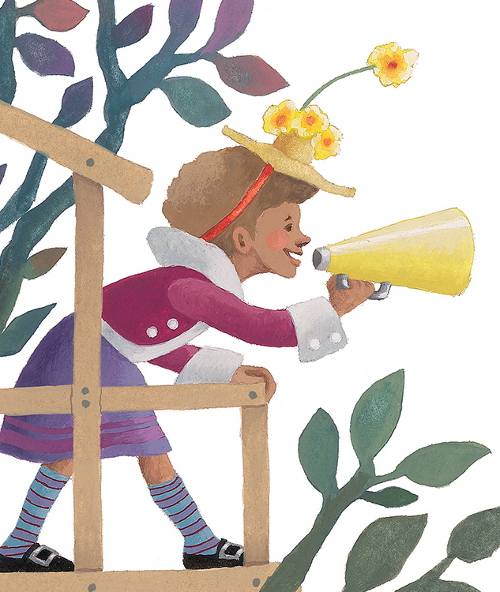 I always like to see her artwork, and her latest illustrated picture book is Kyo Maclear’s Julia, Child, released by Tundra Books in July. While the story contains no true knowledge of (the real) Julia Child and should be taken with a grain of salt and perhaps even a generous pat of butter, we hope that you will find something here to savor. It tells the story of Julia and her friend Simca. Simca would be French cookbook and author Simone Beck, who once worked and wrote with Child (Mastering the Art of French Cooking). This book imagines a childhood friendship and two girls who work to bring cheer and imagination into the lives of the adults around them with their cooking. Noting that “too many grown-ups … did not know how to have a marvelous time,” they set out to create recipes for them. It works for the poor, tired, harried adults — until they begin to argue. The girls then decide to make smaller portions for the grown-ups, “just enough to feed the sensible children from whom these senseless grown-ups grew.” The cookbook they create here? Mastering the Art of Childhood. Morstad used gouache, ink, and Photoshop to create the illustrations. Oh! And don’t miss Jama Rattigan’s July chat with author Kyo Maclear here at her site, Jama’s Alphabet Soup. Here’s a bit more art. Enjoy. 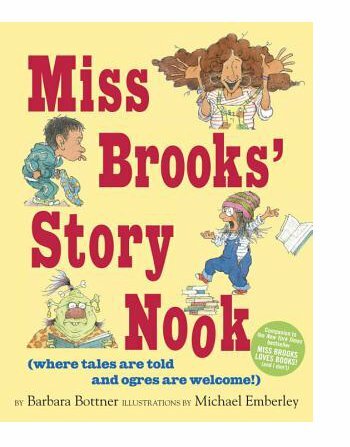 Today over at Kirkus, I’m shining the spotlight on Barbara Bottner’s Miss Brooks’ Story Nook (where tales are told and ogres are welcome! 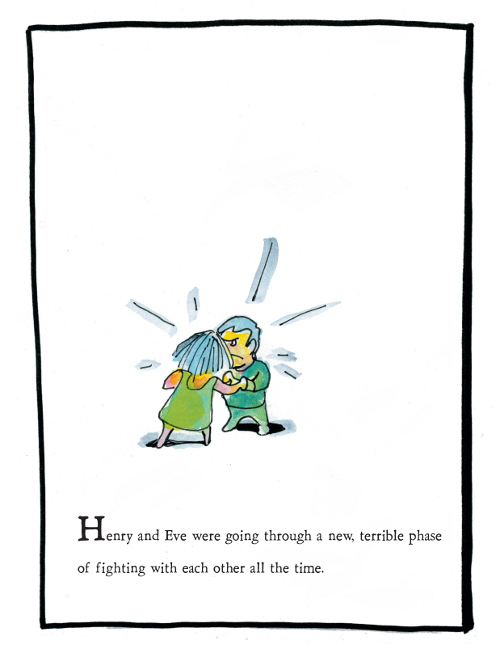 ), illustrated by Michael Emberley. That link is here. Also, yesterday at BookPage my interview with author-illustrator Cece Bell went up, as well as my review of El Deafo, her graphic novel. That is all linked here. And remember: I featured art from El Deafo back in June. That’s here. 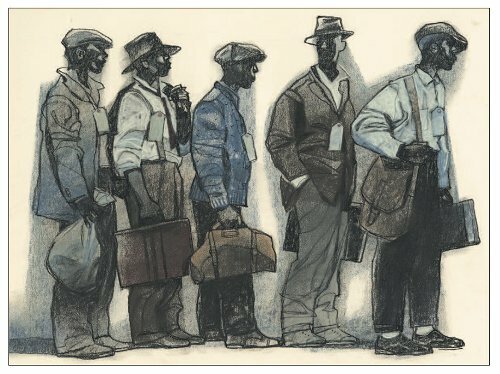 Last week, I wrote here about J. Patrick Lewis’ Harlem Hellfighters (Creative Editions, August 2014), illustrated by Gary Kelley. And guess what? I saw yesterday that it up and won an Original Art Award from the Society of Illustrators. See here for more information and the other winners. I have some art from this book today. Enjoy. Well, not really, even if he’s illustrated himself as one here. 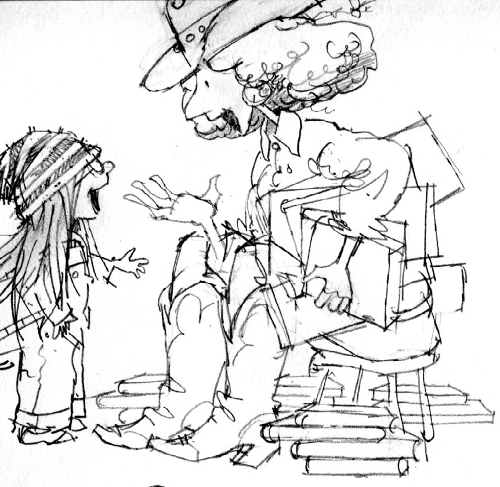 So, we chat—the link is here—and then next week at 7-Imp I’ll follow up with some sketches and art and even deleted scenes from Peter. 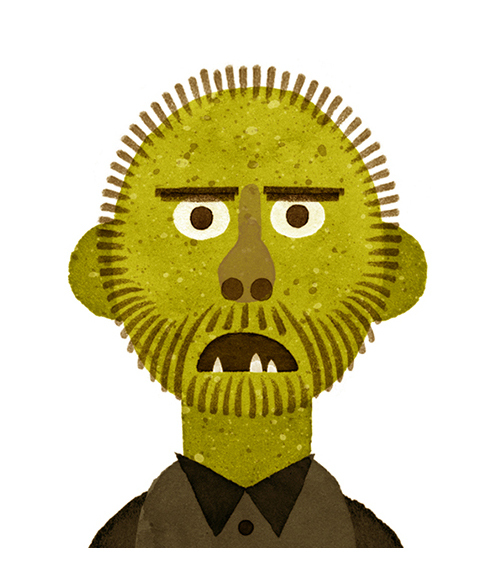 Illustration of Peter Brown copyright © 2014 and used by his permission. 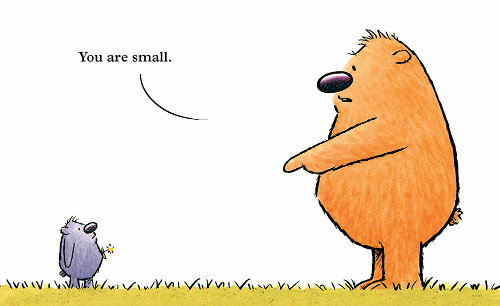 Over at BookPage, I’ve written a review of Anna Kang’s You Are (Not) Small (Two Lions, August 2014), illustrated by her husband, Christopher Weyant. So, I’m sending you over there today to read about it, but I’ve got a bit art here at 7-Imp today to go with it. Today over at Kirkus, I write about a new collaboration from J. Patrick Lewis and Gary Kelley, Harlem Hellfighters. Last week, I chatted (here) with Diane Dillon, and I also wrote (here) about Liniers’ What There Is Before There Is Anything There (Groundwood, September 2014). Today I have art from that book (pictured right), as well as the last book Diane and Leo Dillon did together (pictured above), If Kids Ran the World (Blue Sky Press/Scholastic, August 2014). Yesterday I did a guest blog post at BookPage, talking about my favorite new illustrators. That is, those illustrators who have come to prominence in the past couple of years. 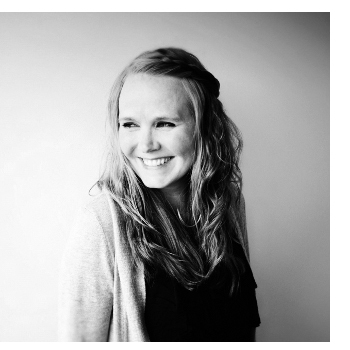 I snuck author-illustrator Birgitta Sif onto my list, and today she visits for breakfast. Yep. That. I think she’s one to watch, and below she talks about what else she’s done, beyond Oliver and Frances Dean, as well as what’s next for her. Best of all, she shares some art and sketches. Let’s dream big and go for the Nutella-filled aebleskiver with strawberries.